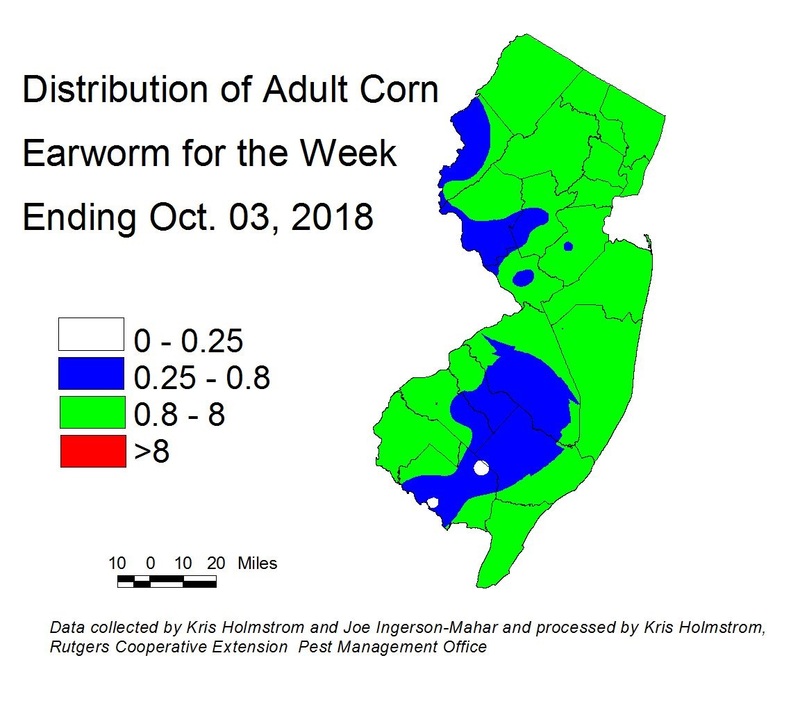 European corn borer (ECB) moth catches remain low. There will be no map in this edition. Note: Trap catches from Morris and Sussex counties are not represented on today’s maps. 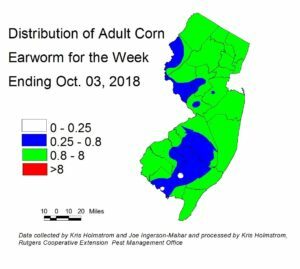 Corn earworm (CEW) catches are rising and falling with nighttime temperatures, but overall have settled into moderate late season levels. The CEW pheromone trap network in the southern counties indicates a similar population (see CEW blacklight map at left, and pheromone trap map at right). There are many fewer pheromone traps than blacklight traps. This results in much broader colored patches on the pheromone maps. The green area on the blacklight map indicates an approximate 3-day silk spray schedule. On the pheromone map, the red area indicates a solid 3-day schedule depending on location. Nighttime temperatures that dip into the 50F range will delay adult activity and larval development. 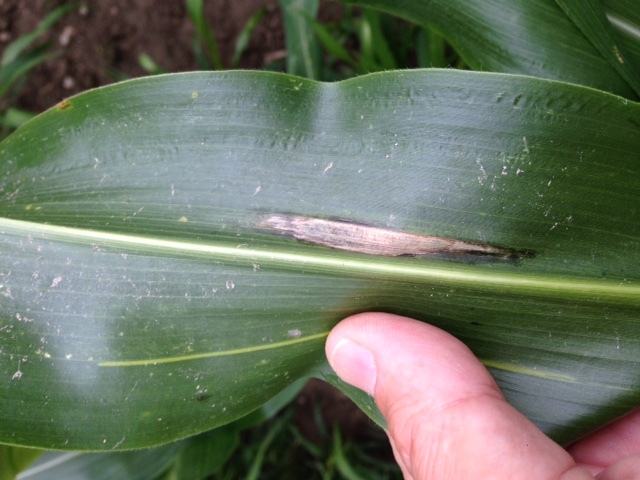 Northern corn leaf blight (NCLB) remains a significant threat to late sweet corn. This foliar disease of corn causes elongated, gray lesions on the leaves (see photo at left). NCLB attacks older tissue first, but can move further up the plant when wet conditions permit spore production and germination. Ultimately, NCLB can cause unsightly lesions on ear husks and even poor ear size if is uncontrolled. If NCLB is detected in sweet corn prior to silking, one or more fungicide applications may be warranted. See the Sweet Corn section of the 2018 Commercial Vegetable Recommendations for useful fungicides. Growers are well into harvest now. Excessive rains and high soil moisture during the past month have resulted in extreme levels of fruit rot unrelated to Phytophthora (although this disease was also made worse by the rains). In a number of cases, good looking fruit are found to be partially filled with water, and beginning to ferment internally. This results in a rot that is not necessarily obvious in the field, but manifests itself after fruit have been removed. This condition is certainly related to constant, high soil moisture, although the mechanism is unclear. 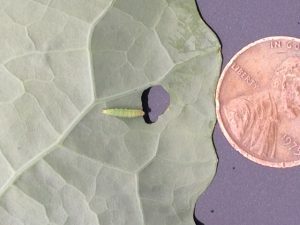 Late summer cole crop plantings are experiencing infestations, primarily from imported cabbageworm (ICW) (photo at left) and diamondback moth (DBM) larvae (photo at lower right), and less commonly from beet armyworm (BAW). 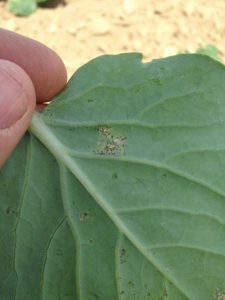 While all are damaging to these crops, DBM and BAW are more difficult to manage, as it is quite resistant to synthetic pyrethroid insecticides. DBM and BAW are effectively managed (along with all other caterpillar pests) with insecticides in the IRAC class 5 (Radiant, Entrust (OMRI approved)), and class 28 (Coragen, Exirel). DBM larvae are very small and are tapered toward both ends. They thrash violently when disturbed. ICW larvae grow larger and have a covering of velvety hairs as they grow. Check 5 consecutive plants each in 10 random sites within the planting. Consider treating if 10% or more leafy cole crops are infested at any stage, or in heading types in the 0-9 true leaf stage. 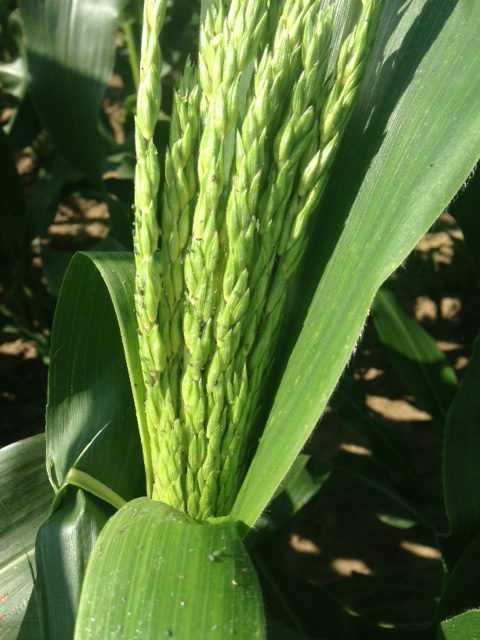 In heading types from 9 leaf to early head, a level of 20% plants infested may be acceptable. As heads form, the threshold should drop to 5% plants infested with any larvae, to protect the marketable portion of the plant. Warmer than usual weather, and continued wet conditions have resulted in a number of early fall broccoli and cauliflower plantings suffering from significant alternaria infections. Heads that are not dome-shaped (able to shed water) are prone to these infections, and planting a fall crop in the same field as the spring crop adds to disease pressure. 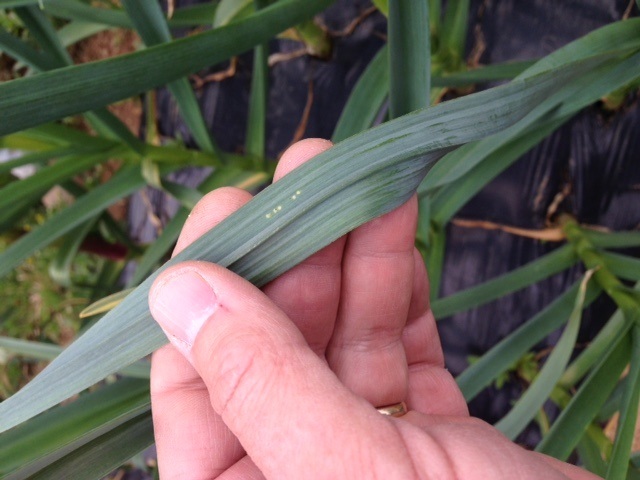 Do not wait for the characteristic target-shaped lesions to appear on leaves of these crops. Begin a fungicide program early. Check the 2018 Commercial Vegetable Recommendations, Cole Crop section, for suggested materials and rotations. 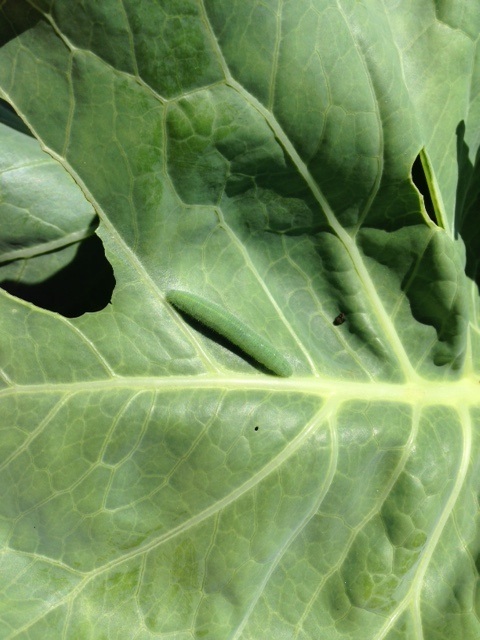 Additionally, crucifer downy mildew (photo at left) has been found on collards and broccoli in a number of locations. This downy mildew organism causes small yellow lesions on the upper leaf surface. On the lower surface, pale whitish sporulation may be detected. Lesions can ultimately cover much of the leaf surface. While all crucifers are susceptible to this disease, collards and broccoli are often the most heavily affected. Check the 2018 Commercial Vegetable Recommendations, Cole Crop section, for suggested materials and rotations. 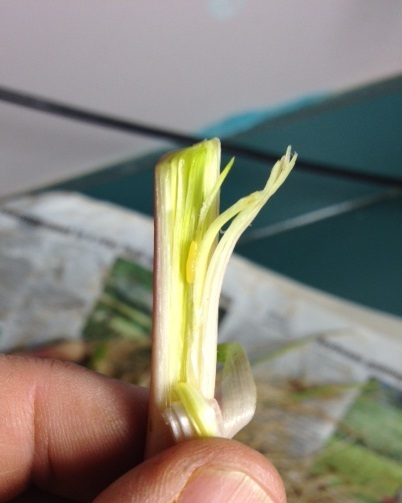 This is the time of year when growers should consider protecting their late allium crops against ALM. This may be done with foliar insecticides (including the OMRI approved spinosyn, Entrust), or with row covers. It is likely that this pest will be active through mid-October at a minimum. Check fields for the presence of adult feeding/egg laying scars (see photo at right). Egg deposition will result in maggots tunneling down the length of leaves and into the neck of allium plants (see photo at left). This can introduce rot organisms into the plants and make them unsalable.